Large scale projects typically involve many stakeholders, contractors and suppliers, which can lead to increased complexity and more challenging situations. Delivering such projects on time and within budget requires considerable coordination and management skills; traits that one US energy company needed in order to complete its most recent expansion project. The locations of oil deposits are rarely close to a refinery, so it is necessary to use a series of pumping stations to transport the oil from its source to the facility. The objective of this project was to convert an existing gas pipeline into a crude oil pipeline with a pumping capacity of 320 000 bpd of light crude. Although this is a huge undertaking, the conversion is more cost efficient and environmentally friendly than constructing an entirely new pipeline. However, the project required all new pumping equipment to be installed, a task that would demand considerable expertise. The challenge to design, manufacture, install and commission 15 pump skids in just ten months was awarded to Sulzer. Spanning three states, working through the cold, winter months and coordinating with seven different internal and external partners, this project had potential challenges throughout its duration. The whole project took years of planning and involved the local authorities and the power companies that, in many cases, needed to upgrade the electrical supplies to the pumping stations. These supplies dictate the size of the electric motors that can be used to power the pumps and as such form the starting point for Sulzer, which supplied this equipment. The logistics required to expand the pumping stations and increase capacity are enormous, but any such project also needs expert design and management skills to be successful. Sulzer understands the requirements of such projects and the expectations of the client were very high, having experienced less-than favourable results with a different supplier on a previous project. One of the most important steps was the appointment of the project manager, who would be the single point of contact for the client as well as collaborating with the other stakeholders and contractors. As part of the project, new contracts had to be signed with the energy providers in each state to receive the necessary electrical supplies in line with the feasibility study that was undertaken at the very beginning of the project. These supplies affected the design of the electric motor that was installed with each pump as well as the performance of the pump. The pumps for each pumping station were designed based on the data provided by the customer. For each location, there would be information relating to the increase in head, pressure, flow, fluid viscosity and temperature that would dictate the design of each pump. As a pump manufacturer, Sulzer has a wide range to designs that can be tailored to suit each application. In this case, the pumps were based on the HSB horizontal axially split single stage double suction pump. This has a proven record of both reliability and efficiency in crude oil pipelines around the world. Capable of pumping up to 10 200 m3/hr at a head up to 550 m and able to operate with temperatures up to 200°C and pressures up to 2 200 psi, the HSB pump is extremely versatile. This is matched by its precision design that ensures smooth running and durability as well as ease of operation and maintenance. The pump skids were designed to a typical pipeline configuration but tailored to the customer’s specific requirements, including figures for energy efficiency. In projects of this scale, pump efficiency can be the deciding factor in the operational profit of the pipeline. Every manufacturer that bids for these contracts must be able to deliver excellent performance in terms of reliability and efficiency. A typical pump in this project might require 2 100 kW power input to deliver a flow of 2 100 m3/hr with a head of 250 m, depending on the specifications for the pumping station. In each case the design was scaled and fine-tuned to meet the exact requirements of each location. In this way, the optimum pumping conditions and efficiency could be maintained throughout the pipeline. The customer fully understood the complexity of this project and the logistical challenges that it presented. Therefore, to minimise the management burden, the major contractors on the project were chosen for their expertise and their ability to deliver large sections of the work in-house. In Sulzer’s case, the pump expertise was already proven, but as a turnkey solution provider, it could also manage the transport and installation of the pumps as well as the supply of the electric motors. The delivery of such a complex project required in depth planning to ensure it would be both cost effective and delivered on time. Careful coordination of both internal and external suppliers was essential to keep the work on track. Above all, it was the flexibility of the team that would enable the successful completion of this crucial project. Hard work, dedication and the ability to adapt to an ever-changing schedule were just a few of the many traits that the Sulzer team exhibited throughout the duration of this project. In fact, the collaboration between the Sulzer team and the client’s many representatives proved to be successful, allowing everyone to concentrate on their core responsibilities. This included Sulzer’s on-site teams helping with the alignment of both the skids and the associated pipework, ensuring that it was installed with minimal strain on the pipes. The success of the project started at the top with the decision by Sulzer’s project manager to work on-site rather than in one of the remote company offices. In this way, he was able to deal directly with all the interested parties and provide a more hands-on management of the project. This also helped to maintain momentum within the project and ensured that all the milestones were met. The greatest challenge in a project of this scale is the logistical effort required to build and install all the pumps in a way that is carefully coordinated with the build schedule of the pumping stations themselves. With so many other contractors involved with the construction of the buildings and the installation of the pipework, effective project management was essential for the timely completion of the scheme. As a project for Sulzer, it involved almost every aspect of their business. From the engineers who designed the new pumps, to the manufacturing sites that produced and tested every pump to the field service teams and electromechancial engineers who provided support to the installation teams. 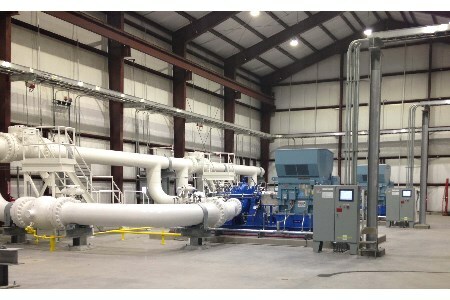 Thanks to Sulzer’s collaborative approach and proactive management, the project was delivered on time and within budget, with all of the pump skids commissioned and operating successfully. The client was very grateful to find that it was possible to deliver such a demanding project successfully.